In his new book; Zero Degrees of Empathy: The Science of Evil: On Empathy and the Origins of Cruelty (US), he calls for a redefinition of Evil as a lack of empathy. "The autism expert tells us about the links between empathy and language, and says our acts of cruelty to one another have at their root a failure to empathise"
"Empathy is all about imagining other minds, appreciating that different people have different perspectives, and responding to their thoughts and feelings with an appropriate emotion. After a career studying autism and the nature of empathy, I see empathy as one of our most valuable natural resources. It has particular promise as an approach to conflict resolution, one that has advantages over viewing a problem through a chiefly military, economic or legal lens." " I’m going to argue that there are at least four (4) different conditions under which someone might choose the empathy route. We will look at examples that embody each of these in turn, which demonstrate these approaches can work, and how urgent it is that these are scaled up." On 17th September 2013 we held our fourth annual lecture, "Zero Degrees of Empathy: Exploring explanations of human cruelty & kindness". Simon Baron-Cohen, Professor of Developmental Psychopathology at the University of Cambridge delivered the keynote speech, and the lecture was followed by a panel discussion with Mary Foley, Peter Woolf and Marina Cantacuzino, chaired by Simon Fanshawe. 11:30 - cruelty the result of Evil.. Evil is defined as the absence of good. Did something bad because they are not good. Empathy is a better term. "Imagine a political system based not on legal rules (systemizing) but on empathy. Would this make the world a safer place? ....Empathizing politicians would perhaps follow Mandela and De Klerk's examples, who sat down to try to understand the other, to empathize with the other, even if the other was defined as a terrorist. To do this involves the empathic act of stepping into the other's shoes, and identifying with their feelings. The details of a political system based on empathizing would need a lot of working out, but we can imagine certain qualities that would have no place." affective - drive to respond with an appropriate emotion. why do we have low empathy? Where do psychopaths come from? 12:11 "Empathy is our most valuable natural resource for conflict resolution." We can all use our empathy.
" Abstract: Empathy is the drive to identify another person's thoughts and feelings and to respond to these with an appropriate emotion. Empathy comes by degrees, with individual differences evident in the traditional bell curve. We now know quite a lot about which parts of the brain are used when we empathize and how empathy develops in children. We also know that early experience affects empathy, but so does biology: hormones in the womb, and specific genes. There are several ways in which one can lose one's empathy, clearly seen in psychiatric conditions such as the personality disorders, including the psychopath. We discuss how people with autism and psychopaths show opposite empathy profiles. Finally, the discovery that there may be 'genes for empathy' implies that empathy may be the result of our evolution." 02: 26 - What is Empathy? Affective: drive to respond appropriately to another's thoughts and feelings. 12:00 where does reduction in affective empathy come from? Study: monkey refused pulling chain for food it it cause shock of other monkey. 24:20 neuro science - many areas of the brain deal with empathy. Baron-Cohen, S, (2011) Zero Degrees of Empathy: A new theory of human cruelty. Penguin/Basic Books. Baron-Cohen, S (2009) Autism and Asperger Syndrome: The Facts. Oxford University Press. How important is our brain’s empathy circuit and what happens to society when it doesn’t work properly? We explored the subject in July with University of Cambridge psychologist Simon Baron-Cohen. 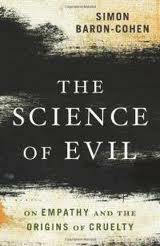 His recent book is “The Science of Evil: On Empathy and the Origins of Cruelty” . Cognitive: recognition of someone else's thoughts and feelings, that's about putting yourself into someone else's shoes, to imagine what they might think or feel. The second component is called affective, and that's the emotional reaction, that when you recognize what someone's thinking or feeling, that it should be accompanied by an appropriate emotional reaction. Not just recognizing that someone is in pain, but caring about it. Wanting to alleviate their distress. Can neuroscience and psychology explain cruelty? In his new book, The Science of Evil, Cambridge University professor Simon Baron-Cohen explains the empathy spectrum we all lie on and that an erosion of empathy can explain why some commit cruel acts. When Norwegian Prime Minister Jens Stoltenberg spoke to his grieving nation in the wake of a rampage that killed 77 people, he said, “Evil can kill a person, but it cannot conquer a people.” That quote, in slightly different translations, zoomed around the world. The autism expert tells us about the links between empathy and language, and says our acts of cruelty to one another have at their root a failure to empathise . You are well known for your research into autism. Recently you have been exploring the concept of empathy. Can you explain how the two are linked? Join Simon Baron Cohen as he presents a new way of understanding what it is that leads individuals down negative paths, and challenges all of us to consider replacing the idea of evil with the idea of empathy-erosion. Listen to audio Please right-click link and choose "Save Link As..." to download audio file onto your computer. is circular - the absence of good, did evil because he is evil. i.e. psychopath can do first part but not proper response. Where empathy resides in the brain? Is zero empathy always bad? Empathy in animals and evolution? Theory of pathology or social? Empathy kin selection - in group and out group? Narcissistic Boss - less empathy maybe good? "True evil seems easy to recognize: the killing of innocent children; assigning whole populations to death by gassing, or napalm, or aerial bombing. These acts go beyond the criminal, the mean, the bad. But what is the psychology of evil-doers?.. John and Ken probe the evil mind with Simon Baron Cohen from Cambridge University, author of The Science of Evil: On Empathy and the Origins of Cruelty." Philosophers - are they irrational? What are the character traits of evil? evil comes from diminished empathy. practice can make you improve on the score. How did Evil peak your scientific interest.? 9:30 Diminishment of empathy - Where does the science come in? 10:30 The Science of Evil - What about the title? 12:00 Some people are good at empathy and use it to manipulate? affective empathy - respond with an appropriate emotion with someone's state of mind. empathy is any state they're in - happiness, etc. 14:00 Where does evil or empathy come from? 17:30 Someone has harmed someone you care about and then you want to hurt them? the empathy drives the lack of empathy? 19:15 People that have empathy turned off or damaged.? 20:01 What happens in the brain when you have empathy for one person and not the other? 23:45 - Aspergers and low empathy. 24:030 Nina - autism and Aspergers. Societal view of the norm. 26:00 Analogy of mass and weight? 28:30 Keith - applying empathy differently toward different people. 31:00 Is it better to be more empathic? Nietzsche, Any Rand, said 'do gooders' are the problem? What is the right amount of empathy for happiness and a productive society? 33:30 - Some people don't deserve our empathy. Hitler. Used to feel the same as you. low empathy because of the background: genetics, environmental. 35:00 Instead of punishing wrong doers - treat them? 36:00 Why can't we say a whole culture is evil? 37:15 force of arms versus persuasion? 38:30 Freewill versus biology. freewill is an illusion? 41:45 Cruel people who empathized with their victims could live with themselves? 42:45 Complicated empathy regulation with in and out groups? generation ago Europe was divided now there's more unity. Baron-Cohen's new book, The Science of Evil: On Empathy and the Origins of Cruelty, examines the role of empathy, the ability to understand and care about the emotions of others, not only in autism but in conditions like psychopathy in which lack of care for others leads to antisocial and destructive behavior. What do you mean when you write about "zero negative" empathy? Radio Show: Andrew Marr explores how far empathy, or the lack of it, can explain cruelty. Simon Baron-Cohen proposes turning the focus away from evil and says we should understand human behaviour by studying the 'empathy circuit' in the brain. Up bringing help determine it. What would it mean to stop using evil and talk empathy? Gwen Adshead, do you think the word evil is useful? Are they 0 degrees people treatable? Val McDermid author, is the word useful? Simon What outcomes would you like? We should think more of how we bring up the young? if your low on empathy you may be the last person to know it. if difficult seeing others, may be difficult to see yourself. people around us are the people who effect us. Is it possible to improve empathy? Simon Baron Cohen says evil can be understood as a lack of empathy, a condition that can be measured and is susceptible to treatment. As a scientist seeking to understand random acts of violence, from street brawls to psychopathic killings to genocide, he has puzzled for decades over what prompts such acts of human cruelty. And he's decided that evil is not good enough. In Waterloo, Illinois a man stands accused of strangling to death his wife and two small children. For an expert witness, the defense could do worse than recruit Simon Baron-Cohen, author of Zero Degrees of Empathy: A New Theory of Human Cruelty. While the casual observer would insist that Chris Coleman is merely evil, Baron-Cohen would contend that the sick videos prove Coleman suffers from a disability, i.e., a severe lack of empathy. Naturally, a man with "eroded empathy" cannot be found guilty of homicide. He may, however, be treated. Perhaps with a combination of hormone injections, gene therapy, and counseling. As a scientist seeking to understand random acts of violence, from street brawls to psychopathic killings to genocide, he has puzzled for decades over what prompts such acts of human cruelty. And he's decided that evil is not good enough. "I'm not satisfied with the term 'evil'," says the Cambridge University psychology and psychiatry professor, one of the world's top experts in autism and developmental psychopathology. Why did you writer book? they did something bad because they are bad. Losing empathy, the shades of losing it? shift away from evil to empathy. Is there validity to empathy? 9:40 - Childhood experiences factors? 12:50 Is there a shortage of empathic people at the top? 14:50 Any thoughts on creating more empathy in society? 16:15 - Is empathy higher in different societies? 17:00 How does your work on autism affect your empathy work? How are you on the empathy spectrum? scientist score lower than the humanities. Putting empathy under the microscope he explores four new ideas: firstly, that we all lie somewhere on an empathy spectrum, from high to low, from six degrees to zero degrees. Secondly that, deep within the brain lies the ‘empathy circuit’. How this circuit functions determines where we lie on the empathy spectrum. Thirdly, that empathy is not only something we learn but that there are also genes associated with empathy. And fourthly, while a lack of empathy leads to mostly negative results, is it always negative? how is it that the scientist can do this cruelty? Society says they are doing Evil. where in the brain does empathy take place? they have strengths - spotting patterns. in humans empathy has taken off. Man is nice at work but beats up his wife? Ramachandran and Mirror neurons - activating them in ASD? PSD, documentation, restoration and reconciliation? Systems of punishment and empathy? Twin studies: Environmental and biological of child and empathy? Evolutionary significances of empathy and the selfish gene? Adolescence and prison - uses an old system? Personality types, Munchausen's syndrome and empathy? Narcissisms, to much codling and attention? Can you make people less empathy? people with high empathy probably don't suffer from it. Across the generations, trans-generational empathy? Is it possible to think of indirect empathy, the bomber empathy? Carole Jahme reviews two new books about the science of empathy, Zero Degrees of Empathy by Simon Baron-Cohen, and Pathological Altruism edited by Barbara Oakley. Where you sit on the empathy spectrum will have an effect over the sorts of things that make you cry. More significantly, how much or how little empathic understanding you possess will shape the course of your life. Empathy is a powerful ability that most mammals possess to a greater or lesser extent. Strange then that science only started tuning in to empathy in the 1960s. Simon Baron-Cohen is one of a few scientists who have continually focused on the genetic and environmental factors involved. On Friday, Baron-Cohen wrote about his new book and his theory of empathy erosion in the Financial Times. A reviewer there used Baron-Cohen's work as a launching point to discuss his own beliefs regarding evil, charging that Baron-Cohen's work reveals "a certain philosophical naivety." And perhaps it does, but that misses the point, as did the reviewer on Baron-Cohen's definition of empathy. Children like David develop empathy effortlessly, and the benefits are both immediate and enduring. They tend to be more popular, better at communication, have higher self-esteem and do better academically. Throughout their lives they find socialising and relationships easier. The benefits of empathy affect others as well. Those in their orbit feel understood, appreciated, valued and included. Further down the spectrum, children like Thomas have trouble developing empathy, and difficulties ensue. Baron-Cohen has made a major contribution to our understanding of autism. Autistic people lack any comprehension that other people have feelings. They do not understand what empathy is. Like most psychologists, he loves categorising and measuring. He describes how our degree of empathy can be measured, and how our scores form the familiar shape of the bell curve. If you want to find your Empathy Quotient (EQ), the questionnaire is in the book. In his latest book, Zero Degrees of Empathy: A new theory of human cruelty, Baron-Cohen, argues that the term evil is unscientific and unhelpful. "Sometimes the term evil is used as a way to stop an inquiry," Baron-Cohen tells me. "'This person did it because they're evil' – as if that were an explanation." As a scientist, Baron-Cohen dislikes the term “evil” and proposes “empathy erosion” as an alternative. One has to confess that it doesn’t quite have the same resonance. “The empathy-eroded Count Dracula sank his fangs into her neck” lacks a certain elan. Why swap terms anyway? Because empathy erosion is more measurable than evil, and thus more congenial to the white-coated technicians of the mind. But why should being able to measure something in the laboratory be the key factor? There is, then, a certain philosophical naivety about this attractively humane study. As a psychologist, the author provides us with some fascinating information about the relation between degrees of empathy and the state of our brains, though he does not pause to reflect on how his moral discourse relates to his scientific idiom. There are some compelling case studies of men and women with little capacity for empathy or none at all, from which Baron-Cohen draws some typically illuminating conclusions. "Empathy is an essential part of normal social functioning, yet there are precious few instruments for measuring individual differences in this domain. In this article we review psychological theories of empathy and its measurement. " WICKEDNESS has long been the preserve of religion. For an act to be evil, it must be significantly wrong, embarked upon with full knowledge of its wantonness and embraced wholeheartedly by the person doing the deed. In “Zero Degrees of Empathy” psychologist and psychiatrist Simon Baron-Cohen argues for a scientific explanation of why some people act in a way that appears to be evil. He thinks that they are sick and that they can be treated. 2010-03-03 -'Empathic Civilization': Do We Have Empathy Or Are We Just Good Rule Followers? In the movie "Blade Runner," the earth becomes populated by a species that looks and behaves just like humans, except they lack empathy. The problem becomes how to identify who is truly human, and who is an impostor. In the movie there was an empathy test. If you took a photo of the person's iris, when presented with an emotional stimulus (a loving phrase, an expression of pain), the true human showed a pupil-dilation reflex only visible using a sensitive camera. The human impostor did not. Prof Simon Baron-Cohen, Professor of Developmental Psychopathology at the University of Cambridge, presents recent advances in our understanding of empathy – the capability to share another being's emotions and feelings – and its links with autism. do you have an appropriate response? scientist lacked of empathy. why? Under what conditions do you loose your empathy? can't look inwards and see themselves from others point of view. look at peoples brains with MRI, etc. 48:00 Various tests on autism and brain, empathy training, etc. more testosterone less able to read empathy at 8yrs. Slide with Nazi doctors. A philosophy that guides them. Possibility to grow in empathy. some may not have choice, genetically blunted. 1:09 Can psychopaths be helped? 1:11 - Role of empathy in the political system? 1:13 - Do people lose empathy? 2010-07-00 - DO WOMEN HAVE BETTER EMPATHY THAN MEN?